Oh, I love a good meme. 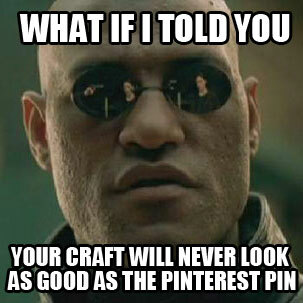 I couldn’t help getting Ryan Gosling in on the Pintester action, and now it’s Morpheus’ turn. You know you love it. There is no spoon. I would ask you to try the gelatin facial mask, but I’ve done that and wouldn’t wish it on anyone. Now if you want to remove the first couple layers of skin, it’s the go-to choice. 9 out of 10 sadist prefer it. I would ask you to try the gelatin facial mask, but I’ve done that and wouldn’t wish it on anyone. Now if you want to remove the first couple layers of skin, it’s the go-to choice. 9 out of 10 sadists prefer it. Loving your blog – thanks for the laughs!